This blog and following post have no political agenda. Their purpose is to illustrate body language examples in the context of current, real-world scenarios and is not oriented towards any particular party's stand on Obamacare or any other ideology, religion, etc. Rep. Issa said, "How dare you presume a failure? How dare you? How dare you? Reporter: "Harry Reid ... "
Rep. Issa: "How dare you presume a failure? The fact is ..."
Rep. Issa: "The fact is this country is based on people saying they won't do things, and at the end of the day coming together for compromise. We continue to anticipate that there's an opportunity for sensible compromise..."
There are several nonverbal signals which tell us that Rep. Darrell Issa's "anger" is feigned. One of these is discussed here. At 0:52, just after the reporter asks his initial question, but an instant prior to Rep. Issa beginning his answer, Issa displays a classic forward lip purse (captured in this image). A forward lip purse (as opposed to a lateral lip purse) is a clear body language signal of clandestine disagreement. 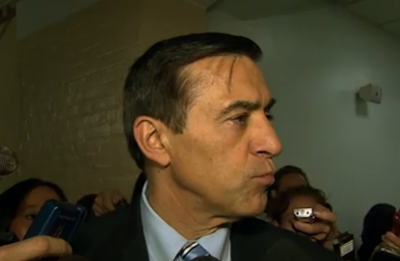 Now less than a second later, Issa appears to be anything but clandestine - he appears to be very openly disagreeing. However this is pretended. It is paramount to note that a forward lip purse is also not performed in the presence of superiors (alphas) - but only for peers or subordinates (betas) - thus it also a signal of where those who display this nonverbal believe they are in the pecking order. When you see a forward lip purse it's a signal that you better have a strong 'Plan B'. What's yours? What other body language signals do you see which indicate Darrell Issa is faking his anger?